We usually associate the Headless Horseman with nighttime, since the darkness enhances his intimidating and ominous persona. In the daytime... well, he's not quite as threatening, but seeing a horseman with no head in all that full detail is still pretty unnerving. In fact, it may be even more so. A headless horseman might be ashamed of his lack of head and prefer to creep around by night, where people are less apt to notice him. By day? There's no hiding there. Everyone sees his headless condition, and if this terrifying equestrian wants to strut that around, well, he must be especially sinister and vain! 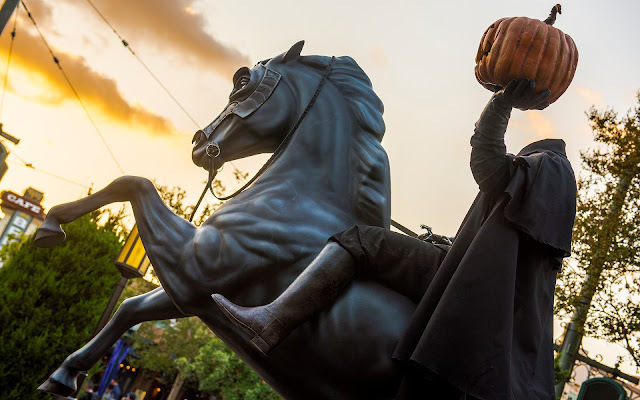 The Headless Horseman in Carthay Circle as the sun sets.